This week’s featured video was produced by Netafim to introduce their FlexNet™ drip irrigation system. Unlike traditional layflat tubing systems that must be pierced for drip-line tubing attachment, their FlextNet plastic tubing has built in connectors to prevent leaks at the hose source. These connectors can be customized to match a farmers specific row spacing from 12-40″. 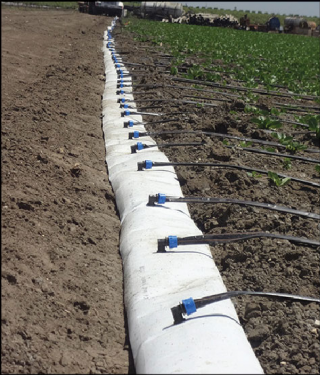 This innovative irrigation system could be useful for irrigation of vegetables, cucurbits, or other crops with drip irrigation in the row beds. FlexNet is simple, flexible and light-weight for maximum portability and quicker movement from field to field. It can be used in surface or subsurface applications and requires no specialized tools for installation.